Labor Day is an important holiday for the craft beer industry to not only recognize, but celebrate with pride. And why shouldn’t we be proud? The industry is thriving, and contributes thousands of jobs and billions of dollars to the U.S. economy. Many of you are probably familiar with the often-debated rule that you shouldn’t wear white after Labor Day. And you probably associate the first Monday in September with the end of summer and the beginning of school. But how many of you actually know why and how such a holiday came to be? The first U.S. Labor Day was celebrated on September 5, 1882. Thousands of New York laborers marched from City Hall to Union Square, where they rallied for the most important labor issue of the time: the 8-hour workday. Oregon became the first state to recognize the holiday in 1887, and several other states were soon to follow. Unfortunately, it took a violent railroad strike before the U.S. government adopted it nationwide. In an attempt to save his bruised reputation, President Grover Cleveland proclaimed the first national Labor Day in 1894. In 2012, the American craft brewing industry contributed $33.9 billion to the U.S. economy and supported more than 360,000 jobs (learn more about these statistics from the Brewers Association). Year after year, craft beer has experienced record growth. The industry is continuing to create jobs for hardworking Americans, as well as contribute to the growth and stability of our national economy. 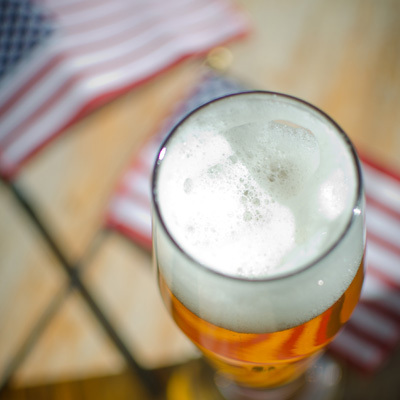 If there was ever a way to toast this country’s hard-working spirit, it couldn’t get better than raising an American craft beer made by American workers at American-owned breweries. And if there was ever a day to celebrate the hard work and economic contributions of craft beer, it would be Labor Day. So today, of all days, we should be sure to fill our glasses with some distinctly American beer styles. To be fair, these styles do have European roots, so we need to give our friends across the pond a good nod of appreciation. However, U.S. brewers have taken great strides to produce all-American versions of these styles—using American-grown barley and hops, native yeast strains and, naturally, American water. This Americanized version of the English pale ale was born in Northern California—but the details of “who, what, where and when” are often debated. Jack McAuliffe of New Albion Brewing Co. and Fritz Maytag of Anchor Brewing are often credited for inspiring the American pale ale—both having brewed hop-forward ales using American-grown cascade hops in the late 1970s. The style’s enduring popularity and success, however, is attributed to Ken Grossman of Sierra Nevada Brewing Company. American pale ales are slightly hoppier, lighter in color and lower in malt sweetness than their English counterparts. Strong American hop profiles (grass, citrus, pine) should be present, but not obnoxious. Overall, they should be super refreshing with strong carbonation, moderate alcohol and a crisp, dry finish. Another California-born style, the steam beer was invented in the late 1800s. Traditional steam beers (often called California common) were inexpensively made and intended for blue-collar consumption. Today, steam beers are proudly made with high-quality ingredients. Anchor Brewing Co. is credited with creating the modern-day “steam beer” (it even owns the trademark on the name). Anchor Steam is considered to be the prototype for this style category, although several brewers have adopted the unique style. Steam beers are fermented with lager yeast at ale temperatures—which technically makes them a hybrid style. Steam beers are malty with notes of caramel and toast, lightly fruity and pretty dry and crisp. This style tends to have a distinctive woodiness from the use of Northern Brewer hops. Alcohol floats around five percent ABV, give or take half a percent. The name and origin of this style has been greatly debated by brewers all over the U.S. Those who live in or around the Cascadian watershed call these beers Cascadian dark ales (CDAs), while pretty much everywhere else in the country these beers are referred to as American black ales or black IPAs. Many east-coasters credit Greg Noonan from Vermont Brewery and Pub as the inventor of the style, but the Pacific Northwest folks might tell you otherwise. What we can all agree on, however, is that this category of super hoppy dark beers is American in origin. American black ales taste like really roasty IPAs (or really hoppy porters or stouts, depending on how you look at it). They are super dark, almost black in color, with a noticeably strong American hop bitterness and flavor profile—think pine and citrus. Coffee, dark chocolate and even caramel malt flavors are common in this style. “In Defense of Language: or How I Learned to Stop Worrying and Love Black IPA” | Greg Koch, Stone Brewing Co. This Labor Day, grab an American-brewed craft beer and join me in big toast to all the hard-working women and men in the craft beer industry!